Ok, so this is one post that I have been putting off for sometime. Not because of idleness (although during the winter evenings it’s a little difficult to muster any energy !) but because I may have clocked about 15 attempts! I didn’t go in to this blindly , oh no I knew this was going be a challenge another reason why it might have taken me a little while to get started. 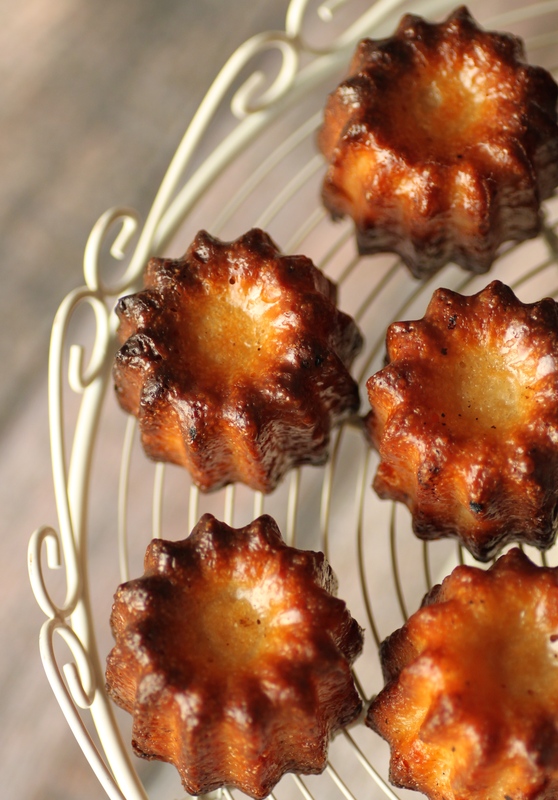 Cannele de Bordeaux is the stuff of pastry legend, a small French pastry a specialty of the Bordeaux region of France with a soft and tender custard center and a dark, thick caramelized crust. Trust me to devour one will blow your mind, to make them yourself will literally drive you crazy. Before getting started I spent a long time searching for the perfect recipe, most call for copper moulds, at £20 a pop for one mould is bit steep by anyone’s standard. Next they nearly all stated the need for beeswax to coat the frozen moulds , to give these little cakes that caramelized shell, getting beeswax wasn’t the problem how to actually use it to coat the moulds is another challenge all together. Anyway after what seemed like months of scouring the web and cook books , as well as constant nudging from Spock to make his favorite pastries I came across two beautiful blogs , EatLittleBird and Butter And Brioche, who both posted about a recipe in Rachel Khoo’s book My Little French Kitchen . Hurrah!!! Now it still took me many attempts to nail it, I used silicone moulds instead copper and no need for beeswax I just coated with butter or vegetable spray. My biggest challenge was the temperature of the oven, too high then the outer shell of the cakes become too hard, too low then they are under done. The balance for me was achieved by reducing the time and temperature than recommended , not too much but enough to get perfect results each time. Also letting the batter sit for at least 48 hours is definitely a winner , it gives the flour enough time to hydrate giving a lovely light and custardy centre..amazing! Go on give it a go.. any tears are really worth the prize, alternatively next time you find yourself in a French patisserie either here or if you’re lucky enough in Bordeaux you must give them a try. Enjoy! In a saucepan over medium heat place the milk, butter and vanilla bean pod. Bring to a light boil them remove from heat and leave to cool. Tip the sifted flour, sifted icing sugar and salt into a large bowl. In a separate bowl, lightly beat the eggs and yolks together. Strain the batter though a sieve into a new clean bowl, pressing through the lumps until a smooth batter forms. Add the rum or brandy and vanilla bean pod. Cover with clingfilm and place in a refrigerator for 48 hours or longer . Stir every so often. 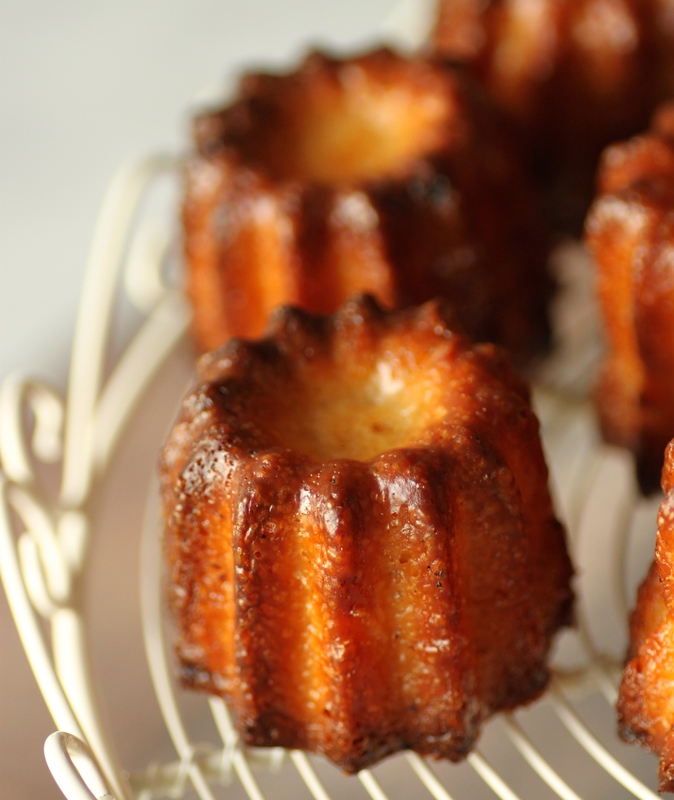 When you are ready to cook the canneles, preheat the oven to 240C (460F). Heat a buttered silicone moulds for five minutes, then remove from the oven and ladle in the batter leaving just over 1 cm gap from the top. Cook for 15 minutes, then reduce heat to 190C (370F) and cook for a further hour, until browned and clean when a skewer is inserted. Because of my oven I only needed to bake for a further 50 minutes any more and they shells were too hard, but I guess it might just come down to taste. Leave to stand for about 5 minutes then remove from the moulds and leave to cool on a wire rack. As they cool, the outside develops a crisp crust. I also tried making mini canneles , but I think the above timings need some tweaking still as they were very much over cooked. Look out for a future post on the mini versions! They look amazing. Well done! Hi Amallia! Thanks for visiting! Love the recipes on your site.. they look amazing! The cannelles do look very nice indeed and with the rum content I’m sure would have gone down very well in the pirate fraternity. However, they sound very tricky to make even with the advantages of modern appliances, so I doubt it would have been possible to produce anything edible in the galley of a pirate ship. I think it much more likely they would have gone for a nice éclair and maybe a tot of rum on the side. Hi Mark! I finally managed to get a pirate theme for you on to the blog! And yes I think you’re right about the oven although I’m not too sure about the eclairs. Thanks for visiting!